Recently saw an ad for an inn in Santa Cruz that mentioned the Monarch butterflies which migrate to winter in California at this time of year. One of the sites mentioned was the Natural Bridges Preserve. I know they migrate closer to me in Southern California as well. In October a 70 mile-wide swarm of butterflies showed up on weather radar in Denver, Colorado. You might automatically think of Monarchs but these were Painted Ladies which look a bit like Monarchs but are smaller. A swarm of butterflies, a swarm of dragonflies, or a swarm of honeybees; better than a swarm of locusts or a swarm of fleas. Stream of Consciousness Saturday is hosted by Linda G Hill. The prompt word for today is “arm.” It may be used alone or as part of a word. Featured image of Monarch butterflies via wikipedia. 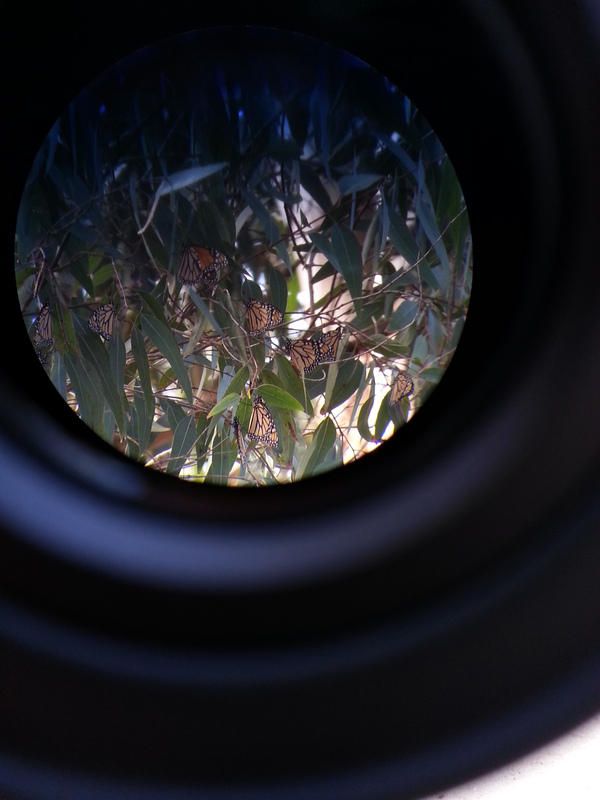 This entry was posted in Blogging, Blogging Community, California, Nature and tagged #Butterflies, #Stream of Consciousness Saturday, Monarch Butterflies on November 10, 2017 by Deborah Drucker. Lovely. Butterflies are some of my favorites. I love those monarchs. I have a mini butterfly sanctuary in my backyard and they come and lay their eggs and go through their life cycle. The grandchildren all see the miracle of life at the milkweed plants. I appreciate your post. Enjoy! Love the butterflies! Monarchs need the milkweed. Used to see it every where when I was a kid in the 60’s, but you seldom see it now. Folks starting to intentionally plant it for the sake of the monarch. Great take on the prompt Deborah, loved the images. Theyr’e like mobile flowers, but so much more! I like that they are free. I would love to be in the middle of that swarm!